Torin Khairegi, 18, in Zinar base. "I joined YPJ about seven months ago, because I was looking for something meaningful in my life and my leader [Ocalan] showed me the way and my role in the society. We live in a world where women are dominated by men. We are here to take control of our own future. We are not merely fighting with arms; we fight with our thoughts. Ocalan's ideology is always in our hearts and minds and it is with his thought that we become so empowered that we can even become better soldiers than men. When I am at the frontline, the thought of all the cruelty and injustice against women enrages me so much that I become extra-powerful in combat. I injured an ISIS jihadi in Kobane. When he was wounded, all his friends left him behind and ran away. Later I went there and buried his body. I now feel that I am very powerful and can defend my home, my friends, my country, and myself. Many of us have been matryred and I see no path other than the continuation of their path." 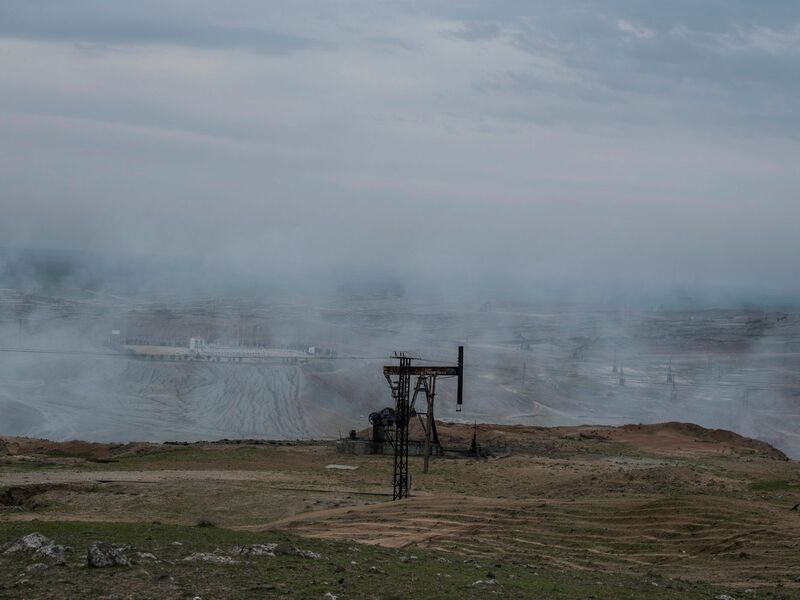 An oil field in Rojava in the northern region of Syria. 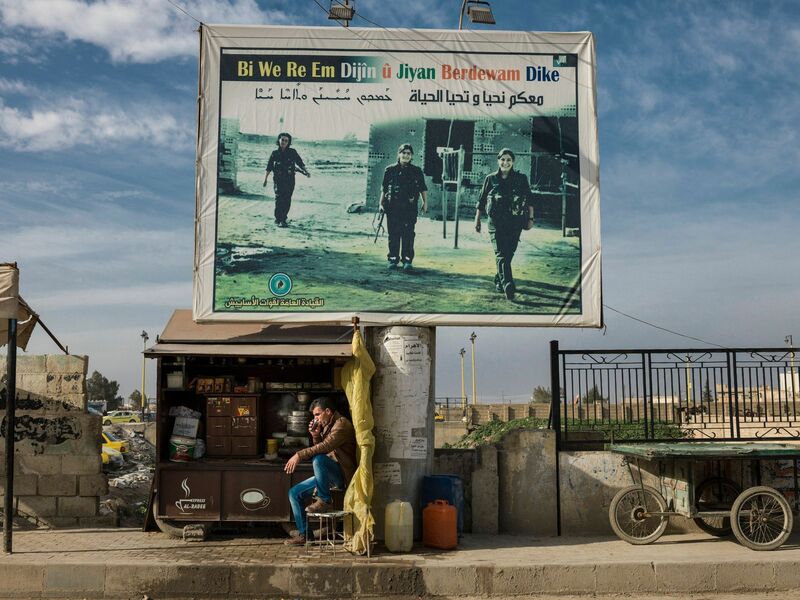 People walking past billboard images of martyrs who died while fighting ISIS: "with you we live on and life continues". 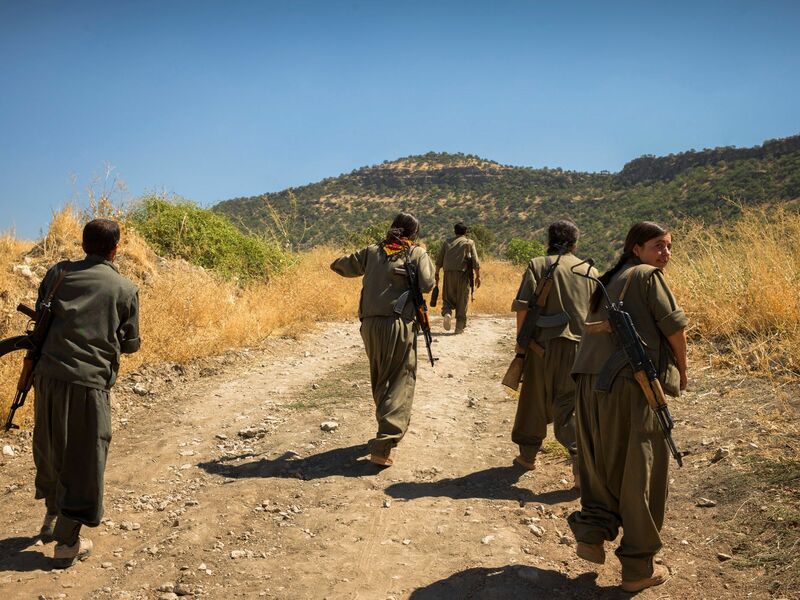 PKK woman fighters working on Qandil Mountains. 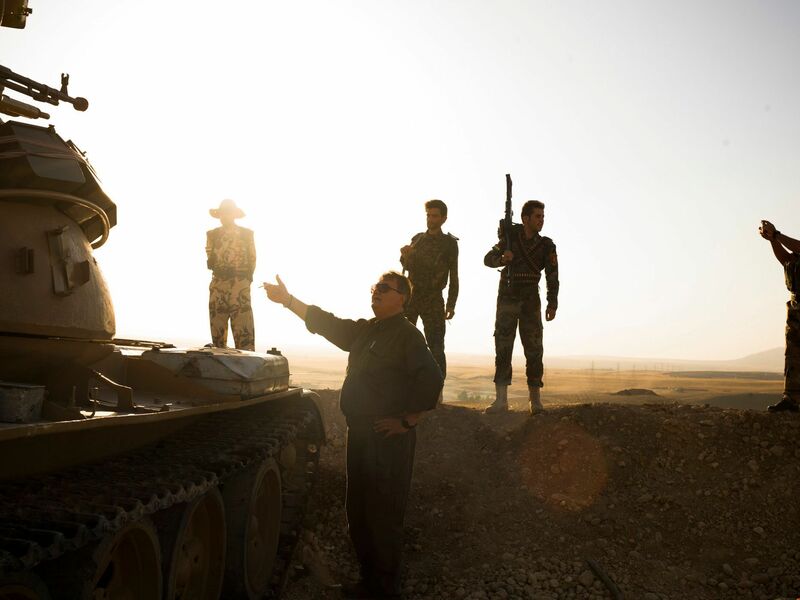 Kurdish Pesh Merga fighters on the front near Khazar refugee camp, where those who had fled there have left after an advance by the Islamic State. 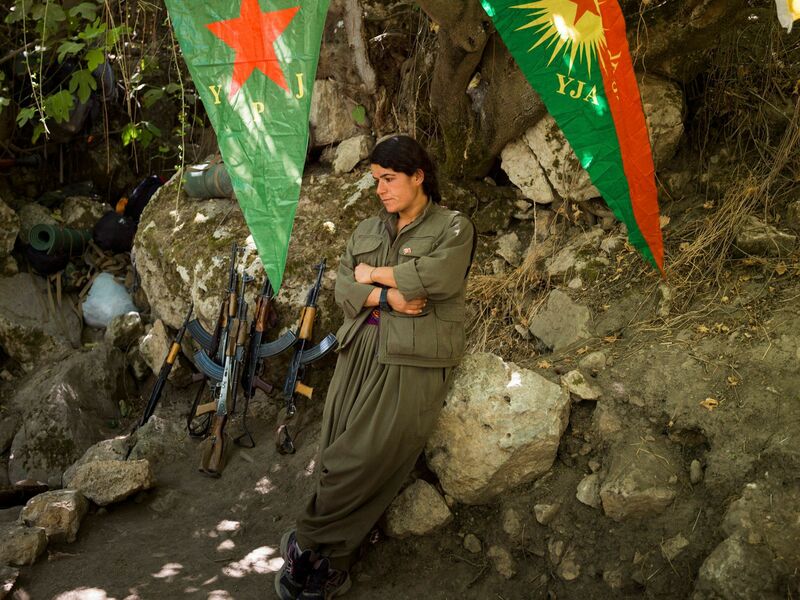 One of the PKK fighters in Qandil Mountains. Suzdar, 21, from Qamishlou, joined YPJ four years ago. "When the revolution happened in Rojava, I knew that I wanted to have a role in it. The majority of the members of our society are women, but the only roles they are allowed to play are those of home-makers and mothers. But in this revolution, the YPJ women make up a whole army. And this is an opportunity for us women to show that we can play a different role. Usually men say that we cannot fight to defend ourselves and others, but with this revolution we are proving them wrong. My comrades and I attacked ISIS checkpoints in Talala. They were fighting back using all the heavy artillary they had. But we won the fight and seized the checkpoint and took the village under our own control. Now I feel that I can do anything I want. But before this, I thought that only my father and brother could protect me. 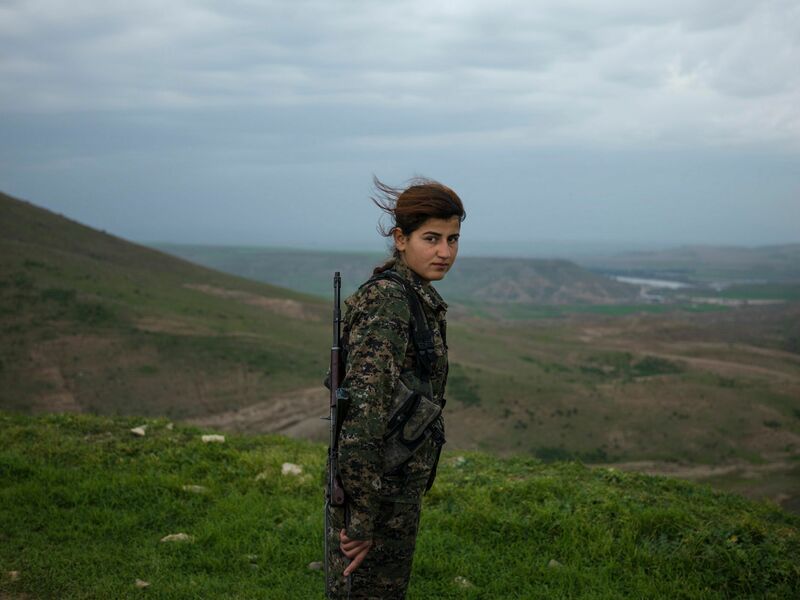 But now as a YPJ woman, not only I can defend myself, but also I can protect others." Cicek was killed at the age of 17 in Kobane. The only belonging of hers that could be brought back to her family was this scarf. Her body is still in Kobane and cannot be returned to her hometown to be buried there. YPJ flag over the grave of a young female YPJ fighter killed by ISIS forces. Cemetery for YPJ and YPG members who were killed by ISIS; an hour from Derek. Wall covered with portraits of martyred PKK members (Kurdistan's Workers' Party) in Qamishlou. Barkhodan Kochar, 16, from Darbasi. "I joined YPJ in 2014, because I wanted to defend my homeland. The war influenced me a lot. Before joining YPJ, whenever I asked my family about politics, they'd say 'that's not your business, you're just a girl'. But when I saw how the women of YPJ gave their lives for what they believed in, I knew that I wanted to be one of them. I feel much more empowered as a woman now. As a 16-year-old girl, I think that I have a very important role in my country and I will keep on fighting until the last drop of my blood is shed." YPJ members playing volleyball and other games at the Martyr Payman Base in Serikani. They came here a few days ago to rest and train for a short while before going back to the frontline. YPJ soldiers at the checkpoint, where identity of the passengers is monitored, as a precautionary measure to prevent any infilteration by ISIS members. YPJ girls chatting near their base in Serikani. Fidan Dilow, 19, from Amuda. "I joined YPJ in 2011. When I saw young girls fighting with guns in their hands, I wanted to be brave like them. For me that was important because they were women who knew why and for what they were fighting. I think that, as a female soldier, I have a very important role, especially in our society where everyone thinks that women should stay at home. The first time I went to the frontline, I was scared when my comrades asked me to shoot. But when I did, I felt so powerful. When I saw an ISIS fighter up close, I felt hatred with my whole body and soul, because I rememberd the eyes of my best friend, who was killed by them. I did not feel comfortable with my family at all. I had no closeness with my siblings and always felt lonely. But now here, I have found my family. These are all girls who think like I do. My life is so beautiful now." Man smoking and playing a game of cards in a cafe in central Qamishlou. Institute for Young Revolutionaries in Terbespe. Everyday PYD (the Democratic Union Party of Syria), an affiliate of PKK (Kirdistan Workers' Party), gathers young people from Rojava area and teaches them its ideology. Many of these teenagers will soon be drafted into YPJ and YPG armies. People in the local market of Terbespe, passing by a moral wall-painting with embedded pictures of female martyrs of YPJ next to the portrait of Abdullah Ocalan. The words above Ocalan's image translate as "the path towards the sun". A wedding dress placed outside a bridal shop in a town near Qamishlou. YPG graffiti can be seen on the walls of adjacent buildings.YPJ and YPG members are neither allowed to marry nor can they have sexual relationships. Their ideology suggests that they are already married to their country and beliefs. Ocalan believes that the source of capitalism is the foundation of family. YPJ members during their daily training in their base in Serikani. YPJ members sitting in an armed vehicle in Serikani. The view of a landscape between Kurdish fighters and ISIS in North Iraq. Yazidi refugees from Sinjar in Kurdish controlled Northern Iraq, after they fled for the Sunni extremist fighters of the Islamic State. The view of a Derek town street during a PYD promotional call for new members for YPJ and YPG. The megaphone played revolutionary music and the speaker kept talking about the freedom spirit and the Kurdish democracy. Many young people of Rojava are jobless and their only hobby is coming out to hear the promotional speeches in the afternoon. Cicek's picture attached to the branch of an artificial tree with fake blossoms, at her brother's house in Derek. Cicek's sister, Rojin, 20, seen during the PYD promotional call for new members for YPJ and YPG in a street in Derek town. The megaphone played revolutionary music and the speaker kept talking about the freedom spirit and the Kurdish democracy. "My sister was very naive and sensitive when she left us. But four years later, when she came back to bury the body of her friend who had been killed in Kobane, she was smart and tough and I could see lots of self-confidence in her eyes. When my mother told her 'please don't go back, stay with your mother', she answered 'I left to fight for all the mothers of the world. I cannot stay here'. When she came back for her friend's burial, she briefly visited the house. She kept taking pictures in every corner and with all of us, as if it was her the last party of her life."